The people of Biafra all over the world both at home and in diaspora were shocked to hear Arewa Consultative Forum (ACF) shamelessly saying something against the Sit at home order of the Indigenous People of Biafra (IPOB), which the whole people of Biafra unanimously and enthusiastically accepted as a mark of honour to their fallen heroes and heroines in the tragedy called Nigeria. The people of Biafra worldwide said that it is very shameful indeed that Arewa Consultative Forum which has never condemned the murderous and other atrocious activities of their Fulani herdsmen brothers all over the defunct Nigeria federation were same people able to open their mouths to condemn the collective resolution of the people of Biafra to use a day sit at home to honour gallant men and women who lost their lives because of the genocide and consistent state sponsored pogrom of Nigeria government against Biafra people from Jos riot of 1945 till date. It could be recalled that Arewa Consultative Forum in a Press Statement dated May 28, 2018, released to news and published by some Nigeria media outlets condemned the Sit at Home directives from IPOB. And at the same time calling on the governors and other political office holders in Biafra land to call their youths being IPOB to order and have them drop the Sit at home order. ACF went on to say that the Sit at home order is not in the interest of the national cohesion. However, as Family Writers Press correspondents designated in different cities of Biafra Land went round the cities and conduct interviews to get the reaction of the people of Biafra over the sad press statement released by ACF, a cross section of Biafrans resident in Port Harcourt, Rivers State told Family Writers Press that "we are not blaming the Arewa Consultative Forum (ACF) that much, they have the temerity to make such useless statement against the people of Biafra because Ohaneze Ndigbo and South East governors gave them the audacity to be saying anything they like against us. However, the Sit at Home order must be completely be complied with here in the Port Harcourt city of Biafra Land. When Family Writers Press correspondents in Aba visited different parts of Ariria International Market Aba, most Biafrans interviewed in the market described the press statement of ACF as stupid and inconsequential and warn that anybody found on May 30th desecrating the Heroes Day by opening any market, Bank, school or office in any part of Aba will have himself to blame for anything that befall him and his institution. Family Writers Press correspondents in Onitsha arrived Upper Iweka, Ochanja and Osei Main market, people were shopping and being in high spirit to observe the Sit at Home order of IPOB. When Family Writers Press asked some people around Upper Iweka what they think about infamous press statement of ACF concerning the Sit at Home directives, most of them responded by saying that ACF should channel their concerns for unity and cohesion of Nigeria to Fulani herdsmen and stop them from killing people all over Nigeria including Biafra land here. 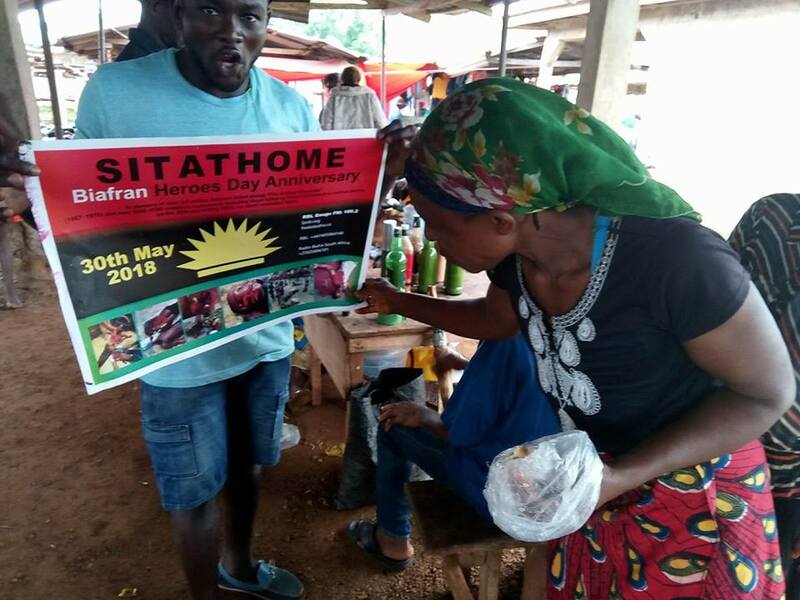 The Onitsha residents used the Family Writers Press platform to tell the world that nothing will stop Biafra Heroes remembrance Day sit at Home order. When Family Writers Press correspondents in Nnewi went inside Nkwo Nnewi Automobile market, few chairmen of the zones interviewed assured Family Writers Press that the businessmen in the market are very much ready to lockdown the market to observe the Sit at home. When Family Writers Press team asked some people at newspaper stand beside Nwanyi-Imo Bus-stop their take on statement credit to ACF, they replied that ACF should mind their business on what is happening in Arewa land such as Fulani herdsmen killings and Boko Haram menace and not peaceful Heroes Remembrance Day celebration in Biafra Land. A cross section of residents met by Family Writers Press team of correspondents in Owerri, said that ACF statement was a another move by Sokoto Caliphate to push Ohaneze Ndigbo and South East governors into another mess if the duo are yet to learn lessons from the conspiracy of silence on Fulani herdsmen killings all over Nigeria by the hypocritical ACF leadership. They however assured the world that Owerri and its environs will be on total lockdown come May 30th. When Family Writers Press correspondents arrived Yenegoa Bayelsa state, all the people of Biafra residing in Yenegoa described ACF statement as laughable and assured that Bayelsa state is very ready for the sit at home order. Specifically, one Azibapu Lawrence, an Ijaw man said that the ACF's outburst against IPOB is a pointer that the IPOB agitation for Biafra is biting harder on the Northern Oligarchy. Finally, FWP joins the people of Biafra to tell ACF to mind their business in North.